Image caption Transport for London has called 2014 '"Year of the Bus"
A trial of free WiFi has begun on two buses operating in London. 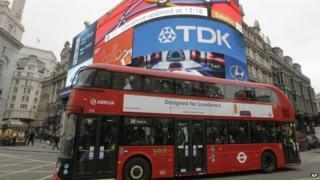 Transport for London (TfL) has installed it on a route 12 bus, operating between Dulwich, south London, and Oxford Circus. It will also be trialled on a route RV1 bus, between Covent Garden and Tower Hill, in central London. Two other technologies involve showing seat availability and also real-time bus arrival information at Vauxhall, Harrow and Hammersmith bus stations.